When someone thinks of Scotland, the words “bagpipe” or “kilt” will most likely appear after a certain time. Some might also come up with the thistle as a symbol for Scotland or the image of castles. When looking deeper into symbols of Scotland though, one can find a wider and more recondite fund of signs. 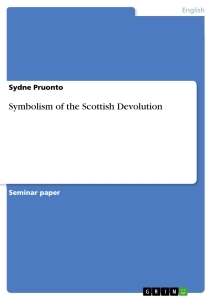 In this paper, I want to concentrate on one major event of the Scottish political and cultural life of the last century and especially decade- the Devolution. The events around this change in politics are filled with symbolism; some subliminal, some obvious. But hardly anything goes without them. First, a short oversight over Devolution in Scotland and an insight into Scottish symbols will be given before the allusions themselves are discussed. This section will start with the Stone of Scone, a pre- Devolution symbol which nevertheless plays a part in Devolution, and from there it will move on with the description of buildings involved into the devolutional process, their meaning for the people and the intentional use of symbols within the buildings. Furthermore, this paper includes an illustration of events of the Devolution, namely the opening of the Scottish Parliament in 1999 and 2004. The paper will finish off with the attempt of an explanation why symbols were so important for the whole process. As a general definition, devolution is the process of transferring powers from a central government to governments at regional or local level. The devolution in Scotland took place in September 1997, when the majority of its people decided in favour of an own Parliament with tax raising powers. Before that, an unsuccessful referendum in 1979, where the voter participation was below the necessary 40%, put the question of devolution on hold for almost 20 years. The 1997 referendum followed an increasing awareness of an own distinct Scottish identity which had been strengthened through a period of neglect during the premiership of Mrs Thatcher. Therefore, the powers of the Scottish Parliament enclosed amongst others local economic development, social work services, the arts and education and training. Already the day of the 1997 referendum- September 11th- might be interpreted as a non arbitrary date- 700 years to the day from William Wallace’s victory over the English at the battle of Stirling Bridge. Now coming to symbols themselves, we first need to define them. Among the variety of symbols in Scotland, there are a few very distinctive ones. One of them is the Kilt. Today it is regarded as a kind of national dress, whereas it had been in its original sense only the dress of highlanders. The watershed was marked by the defeat of the Jacobite rebellion in 1745. As a symbol of possible subversion, it was banned and men wearing the kilt nevertheless could be punished with death penalty or transportation to the colonies. Scots could only wear them as a member of the British Armed Services from then on. Nowadays, the kilt is regarded as a national dress. This changing probably also came from the fact it was forbidden so long and that wearing it marked a distinct Scottish identity versus England. Another sign of Scottish identity is the unofficial national anthem “Oh Flower of Scotland”. The song was written in the 1960s by Roy Williamson of the folk act “The Corries” to provide some patriotic verse for the passionate Scots. Its lyrics are about the defeat of Edward II at Bannockburn in 1314. In 1997, it was also adopted as the official football anthem by the Scottish FA. Especially when playing against the English, the song expresses a strong Scottish feeling. Having given some information on the background of devolution, we can now fully concentrate on the use of symbols in the devolution in Scotland. The Stone of Scone, also Stone of Destiny or later Coronation Stone, is an old block of sandstone on which Scottish kings had been seated on their inauguration. The Stone took its name from the place it came from; Scone in central Scotland. The last king to be seated on it was John Balliol in 1292, before Edward I of England took the Stone with him to London in 1296 during the Scottish War of Independence. For 700 years, the Stone stayed in Westminster where it was used for the coronation of British monarchs. Taken as a trophy, the Stone of Scone stayed the reminder of the injustice the Scottish people had perceived through its absence from Scotland. Although the Stone spent a longer time in Westminster than in Scotland itself, it stayed “Scotland’s greatest symbol of national identity” and the most ancient symbol of Scottish kingship. Therefore, it seemed most appropriate to many Scots to return the Stone to Scotland. There had been early attempts to bring the Stone back; one already in 1314 after the victory at Bannockburn- which had been refused, and then the famous theft of the Stone in 1950-51. But it wasn’t until 1996 that the Stone of Scone was officially brought back, when John Major stated that it was “appropriate to return it [the Stone] to its historic homeland”, accepting that the Stone “holds a special place in the hearts of Scots”. Some saw in the return a feeble substitute for genuine political action and a constitutional reform, others a “powerful reminder of Scotland’s heritage and a symbol of [their] continuity as a nation within the United Kingdom”. On St. Andrew’s Day 1996, the stone was escorted from Holyrood Castle (the Queen’s residence in Scotland) up the Royal Mile to St. Giles Cathedral (the church opposing the pre-1707 Scottish Parliament) and Edinburgh Castle. On the day of installation, leaders of the Scottish Constitutional Convention presented the Declaration of Edinburgh in which they demanded for a devolved assembly for Scotland. This event clearly shows the influence of the Stone of Scone and its return to Scotland on Devolution. It focused the public attention not only on the past of Scotland, that is the Stone and its tradition, but also on the current and upcoming national identity and the constitutional status of Scotland within the UK. Furthermore, the return stimulated the debate about Devolution and probably was of big help for the supporters of devolution. As the devolution processes in Scotland mainly took part in Edinburgh and the city is recognized as the “natural centre of government in Scotland” as well, the focus of this seminar paper will be on Edinburgh too. Nevertheless, Mr. Galbraith wanted to establish a building of “stature and credibility” and not a “second-hand building for a new Scottish Parliament”. Queensberry House itself has only marginally to do with the process of Devolution, but it stood on the place where the New Parliament was supposed to be built and was therefore involved into the operations on the Holyrood site. The house is dating from before 1640 and originally was an aristocratic townhouse, but has been used for many purposes since then; it also underwent a conversion into army barracks between 1808-10 and a hospital between1945-1996. The Duke of Queensberry lived there at the time of the signing of the Treaty of Union in 1707. One room in the newly restored building, the Dewar Room, is dedicated to Scotland’s first First Minister and contains books and memorabilia of Donald Dewar. Philip Schlesinger, „The Reinvention of Scotland“. For full list of competences see David McCrone. BBC Radio 4. Making history. “The development of the kilt and highland costume”. see appendix for the full lyrics. Paul Halsall. “The Flower of Scotland”. Nick Aitchison. Scotland’s Stone of Destiny. Myth, History and Nationhood. Charleston: Tempus Publishing Ltd., 2000. 8ff. John Major in the House of Commons, 3 July 1996. In Aitchison, 148. Michael Forsyth, in Aitchison, 150. Donald Dewar at BBC News Online, “Holyrood Inquiry Part1”. Thomas Hamilton. “Royal High School, Edinburgh”. BBC News Online, “Holyrood Inquiry Part1”. Leaflet The Scottish Parliament.> see appendix. Erd–Demokratie - Ist sie eine Alternative zur neoliberalen Globalisierung und kann sie eine lebendige Kultur fördern? Die politische Kultur Lateinamerikas - Grundlage stabiler Demokratie?